What is SATELLITE DISPATCH RADIO? Imagine your own private radio tower 23,000 miles high with a service area covering all of North America from the equator to (nearly) the North Pole, including coastal waters, the Caribbean and the Gulf of Mexico. Now imagine your fleet of boats, cars, trucks, buses or even multiple office locations within this coverage area all linked together by a solution that provides both regular voice and push to talk capability (just like a walkie talkie). You can speak privately one radio to another. Or with a push of a button, talk to your entire fleet at one time in broadcast mode. 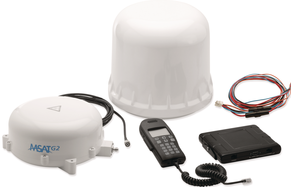 The MSAT G2 is not only ideal for fleets to stay connected to each other via talk groups with one low monthly fee, but this satellite radio solution is perfect for sending and receiving email, tranfering files and downloading weather reports in remote areas where cellular and 3G isn't accessible. GPS Tracking is also available. The G2 is available for land/mobile (Vehicular), Marine (Vessels) and Fixed (in building) configurations. As land based mobile radios are coming to their end of life, more and more industries are implementing the MSAT G2 due to reliability and coverage. In addition to dispatch satellite requirements, SatComs are also playing an important role in Smart Meter deployments. A wireless push-to-talk network, Dispatch Radio Service relies on establishing "Talk Groups"-sets of users who share a common radio channel. Each communicator can support up to 15 Talk Groups. While users can belong to more than one Talk Group, each Talk Group can include as many as 10,000 members. When establishing Talk Groups, priority levels can be predetermined in order to define who will be permitted to listen and speak during each session. Users Pay 1 Low Monthly Fee for Unlimited Talk Time. "Been a customer of ISS for over 10 years now. We have more than 100 vessels that work in remote waters outfitted with the MSAT G2. We use the dispatch push to talk radio for roll call every morning and evening to check in with all of our vessels. This solution works great for us, it's extremely reliable and the service is more affordable than anything else out there."